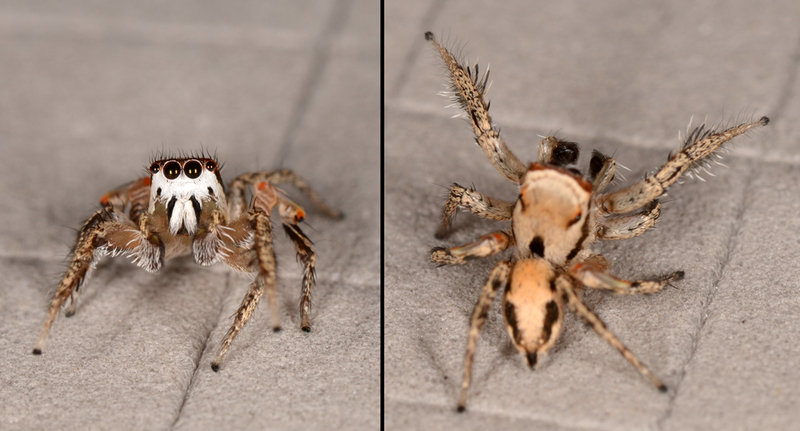 A few days ago we made it safely back to Canada after a month of collecting arachnids in Mexico. While there we couldn’t resist picking up a few other souvenirs in addition to salticids and opilioacarids. One was a bottle of raicilla from the beautiful 400 year old town of San Sebastian del Oeste. Like tequila, raicilla is a distilled liquor made from agave, albeit from a different species in the same genus. The name may mean ‘little root’ but we’re guessing. Selling of raicilla has only recently been legalized according to this site. Raicilla and opilioacarids safe in Vancouver. 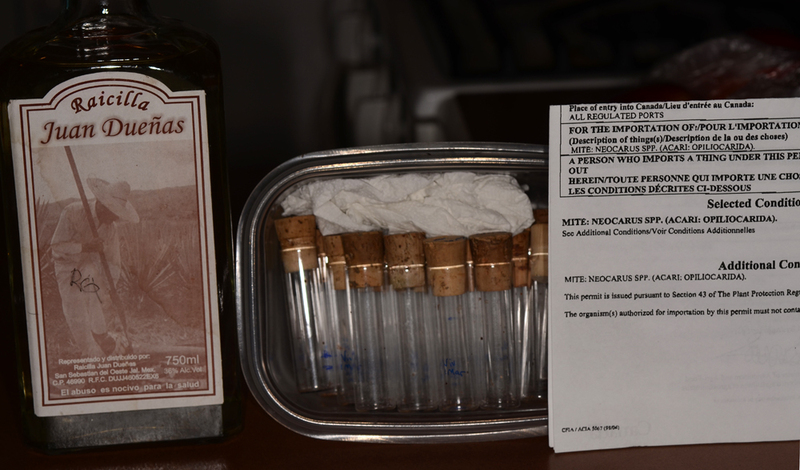 Therefore, I was legitimately able to bring in a bottle as a souvenir, along with my likewise legal container of opilioacarid mites (see permit above!). Unfortunately, the raicilla leaked a bit in my luggage, imbuing my trousers with a smoky flavour. 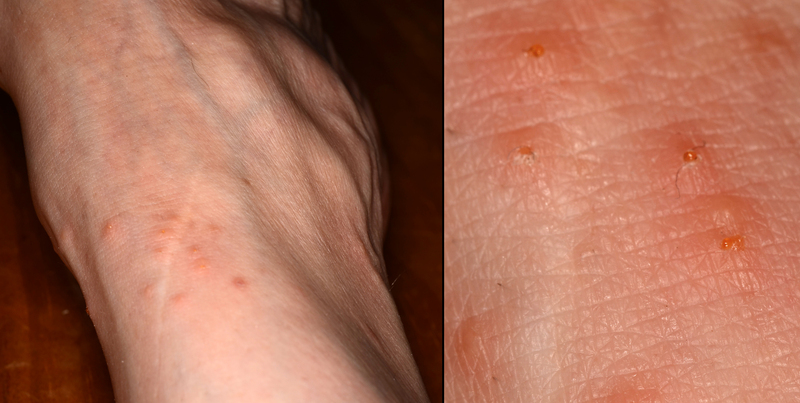 I also brought back some unintended mementos: clusters of itchy, supporating sores on my ankles resulting from bites of larval mites of the family Trombiculidae (Acari: Parasitengona). 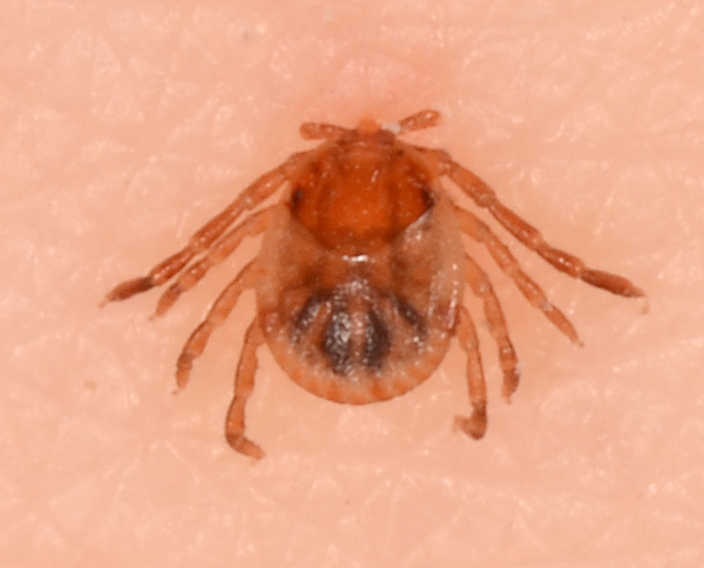 Trombiculids are known as chiggers in North America and scrub itch mites in Australia. As larvae, chiggers are parasites of vertebrates while as nymphs and adults they are free-living predators. 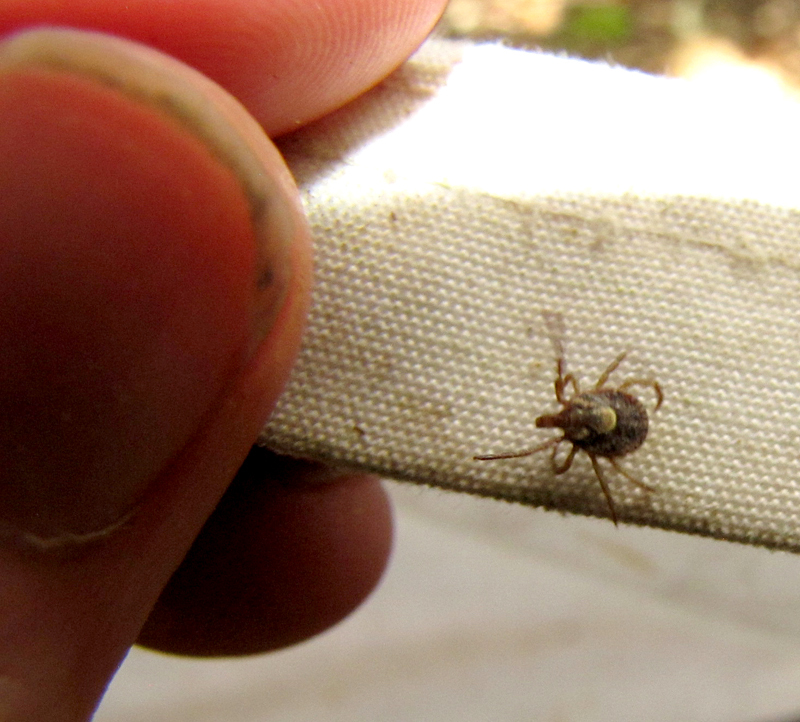 Despite common belief, chiggers do not burrow under your skin. Rather, those that bite humans usually attach only briefly and then drop off, leaving behind an itchy wad of spit that continues to cause irritation long after the wee mites are gone. My right ankle with chigger bites. We experienced many forms of personal exsanguination while in Mexico. Biting flies were diverse (Ceratopodinidae, Culicidae and even Simuliidae) though nowhere near as abundant as in Canada and only occasionally maddening. Ticks, on the other hand, were present in numbers that to me, as a resident of a province where human-biting ticks are relatively uncommon, were disconcerting. Tick-checks after fieldwork were a daily task, and Wayne and I competed for the honour of “most infested”. On our second last field day at Rancho Primavera, I won with a whopping N = 42 ixodids. We hope that none of the ticks we pulled from our integument were carrying noxious bacteria or viruses. But ticks and flies are lightweights in comparison to the champion bloodsuckers of Mexico – vampire bats. We slept safely inside at night at so never got bitten; however, livestock aren’t so lucky. 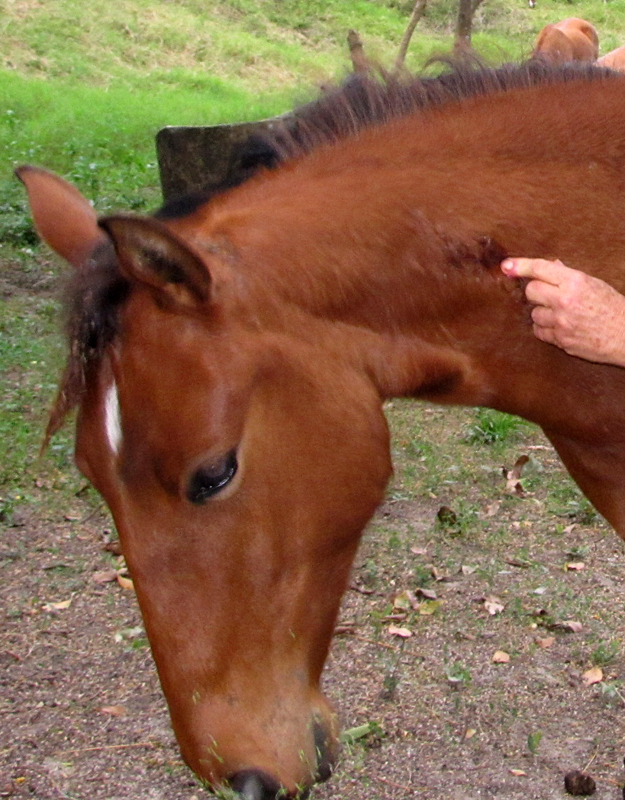 Bonnie Jáuregui, proprietor of Rancho Primavera, showed us fresh wounds on her horses that had been caused by feeding vampire bats (Desmodus rotundus). Vampire bat wound on horse’s neck. She treated them by smearing a warfarin-containing cream on the wounds. When bats returned to feed on open wounds the next evening they would also ingest some warfarin. Then, because vampire bats frequently share their blood meals with roost-mates via regurgitation, the anti-clotting agent would not only affect the bat that fed on the wound directly but also its friends and relatives. Warfarin, yes, garlic and wooden stakes, no. Many Canadians go to Mexico to watch birds. In the vicinity of the UNAM field station at Chamela there is a huge diversity of forest-dwelling, estuarine and marine species. I won’t bore you with my list of twitched birds, but my trip here has allowed me to observe members of several families I’d never previously seen outside of a zoo or a museum (e.g., Cracidae, Fregatidae, Sulidae). But unlike most avian enthusiasts, as well as watching birds, I also wash them. Washing the body of a recently deceased host is one of the best ways to get feather mites (Acari: Astigmata: Pterolichoidea and Analgoidea). While at the station I have ruffled through the feathers of stuffed specimens from their ornithological collection, and was also lucky enough to get to wash a freshly road-killed Buteo magnirostris (Roadside Hawk). The washing yielded feather mites, feather lice, and one hippoboscid fly. The last has been added to the UNAM Chamela entomological collection, and the others get to come back to Edmonton with me. The hawk about to be washed.